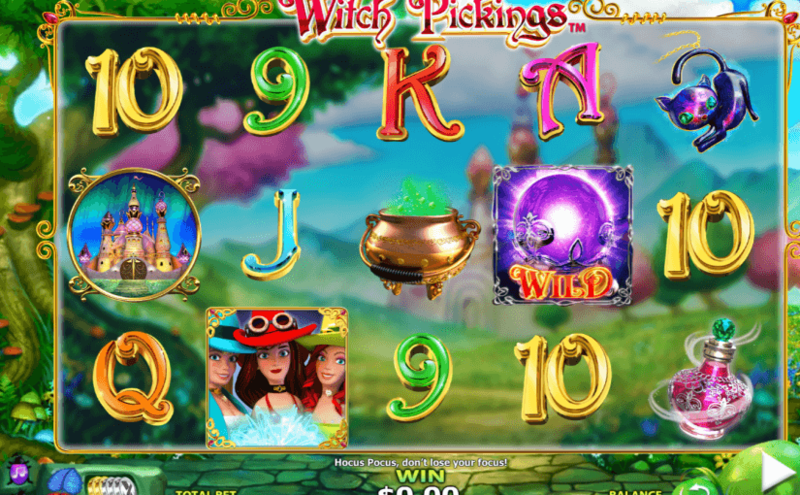 Witch Pickings Online video slot powered by NextGen Gaming contains a total of 5 reels and 25 paylines. It has scatter symbols and a special feature. Scatter symbols appear as three witches and can trigger a Witches bonus when 3 or more appear anywhere. There may only be one bonus round in this slot but it is certainly a corker. When you have special features which are as generous and as good as this feature, you won’t be worrying too much about other features. In the bonus round, players will get to choose a total of three features to add to their free spins game. There are three options in three groups. You will get one option from each group. Available options in group 1 include identical symbols, stacked symbols, or special symbol prizes. The second group contains expanding wilds, extra wilds, and wild multipliers, whilst the final group offers up all win multipliers, pay both ways features, or an extra 5 free games.